Go behind the barricades of the information revolution for an eclectic look at notable people, trends, and ideas. Journey to the center of social, political and economic issues of interest to the technology community. Current trends and events of interest to Web-based marketers and publishers. Occasional reviews look at thought-provoking work in literature, film, music, and other arts. 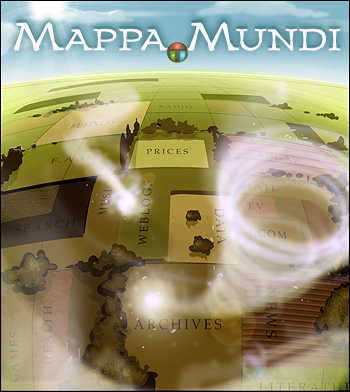 Mappa.Mundi examines information discovery on the Internet via an eclectic mix of ideas about technology, history, and the future of cyberspace. theinfo.org is a brand new community focused on the creation and visualization of large data sets. Help build this potentially valuable resource by participating in the mailing lists and the wiki. ESPG v2.0 is designed to support detailed annotation ("footnotes") of objects (such as artwork or photos), including citations, dimensions, latitude/longitude and other identification metadata. A look at the geography of cyberspace and how researchers help define our perception of virtual spaces. A series about words that describe places and how these words have shaped and been shaped by language, culture and society through the ages.